“Kidwell Meadows — riverfront views!,” contemporary advertisements might have read had John Kidwell’s bold real estate gambit succeeded. His attempt failed but the federal government’s long legal efforts to quash it led to the creation of Potomac Park. In 1869 the City of Washington was struggling to remake itself after the chaotic years of the Civil War. The population of the District of Columbia had nearly doubled, surging from 75,000 to over 130,000. This population pressure encouraged developers to eye property outside the city itself. […] Soon other residential development jumped northward over Boundary Street to the hills of Mount Pleasant. Georgetown druggist John L. Kidwell took another tack and looked in another direction, this time toward the Potomac River. Cities like Boston had been nibbling away at the rivers and bays on which they sat, creating more land and quickly developing it. Up to this point Washington hadn’t needed any more land. But opportunity presented itself as the Potomac River continued to silt up. Agriculture in Washington’s Montgomery County hinterland led to soil being washed into the river. Below the fall line at Georgetown the river widened, slowed, and the silt deposited. The land around Analostan Island slowly fluctuated, as did that on the opposite City of Washington shore. These deposits built up, slowly taking more and more solid form. What Kidwell saw is very well illustrated by an Army Corps of Engineers map of 1871. 1871 Wm. P. Craighill, Army Corp of Engineers hydrographic map of the Potomac River from Aqueduct Bridge at Georgetown south to Long Bridge. (Neither side in the lawsuit seem to have made use of this map.) image–Library of Congress Geography & Maps Div. The land survey resembled the cane brakes found on the 1871 Engineers map. A clearer comparison is visible in another map prepared for the court case stemming from Kidwell’s claim — the cane brakes from 21st Street eastward to 17th Street were not included in the survey. “Kidwell’s Meadows.” Survey by B.D. Carpenter, 1867; Levy Court [Washington County] 1868, Book 2, page 20. Office of the Surveyor of the District of Columbia. 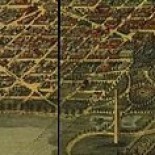 This entry was posted on September 22, 2016 by dchistorystuff in City of Washington, DC History, Development, Early Washington DC, Early Washington history, Foggy Bottom, Georgetown, History, Infrastructure, John L. Kidwell, Kidwell Meadows, Kidwell's Land, Kidwell's Meadows, Legal history, Mapping, Maps, Morris v United States, Potomac Flats case, Potomac Park, Potomac River, Urban development, Washington Canal, Washington DC, Washington DC canals and tagged D.C., District of Columbia, Foggy Bottom, Maps, Potomac River, Washington DC, Washington DC history.